In honor of Nurses Week, Resurrection University wrote a student profile of Claudia Parodi, a graduate who now works for Rainbow Hospice and Palliative Care. 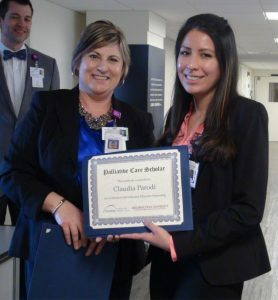 Claudia Parodi is a 2017 graduate of Resurrection University and a nurse at Rainbow Hospice and Palliative Care (since January 2018) who comes highly regarded. Speaking with Claudia, it’s clear she embraces her new role as a nurse and although she didn’t initially plan to pursue hospice as a career, she now states it’s her calling. Claudia offers advice for nurses just getting started in their careers: “Don’t be afraid to explore and learn new things. Hospice wasn’t what I thought I would end up doing. You never know what field you will be working in. I was always interested in the medical field and in healthcare. I liked the day-to-day patient interaction that nursing provides. It’s also a broad field and you can go so many routes. You are constantly learning. Even 10-20 years from now, I’ll still be learning something new,” she said. So far, it looks like Claudia is well on her way to achieving her goals. Adapted from a Resurrection University publication.